Sad. But failure has consequences my friends. Thanks to Jeff Murray K1NSS for alerting us to this sad situation. Maybe it has something to do with the fact that this chain of stores is sometimes referred to as "America's Temple of Pseudo-Science" but I just don't seem to find a lot of radio-useful stuff in Whole Foods. However, at the check-out stand this week something caught my eye: Grilling Planks! Who knew? Apparently you soak these boards ("Sustainably Produced in the Pacific Northwest - USA") in water, then you grill your food on them. They are available in various wood types -- above you can see Cedar and Hickory. I put the Altoids can in there for a size reference. These grilling planks seem well suited to serve as breadboard-style chassis, front panels or even cabinets for homebrew rigs. I decided to make my book "Us and Them -- An American Family Spends Ten Years with FOREIGNERS" available to a wider audience. The suits at Amazon Kindle allow me to make it available in e-book Kindle form FOR FREE for a five day period starting today. So this would be a good time to put a copy in your Kindle. 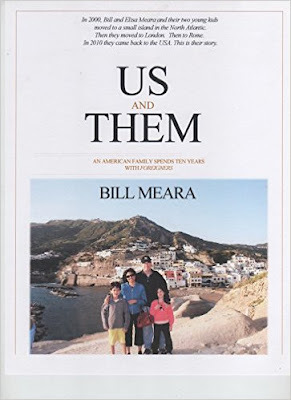 I think it would be a good book for the beach. Please spread the word -- let friends know of the free book offer. 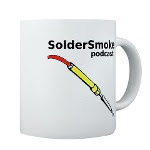 SolderSmoke HQ Station WINS Field Day! Again! First, I need to make clear that that is NOT me in the picture above. This year I chose to compete as an "E" station: "At home, with the air conditioner on, but using a battery instead of the normal AC poser supply." This is, of course, only one step from the bottom on the laziness scale -- I did hook up the 12 volt gel-cell. But I made up for it with an unusually large dose Knack-ness. I used my BITX Digi-Zia scratch-built homebrew SSB transceiver. So, with my whopping 11 contacts I feel confident that I won the "1E Homebrew SSB Transceiver, Northern Virginia" category. 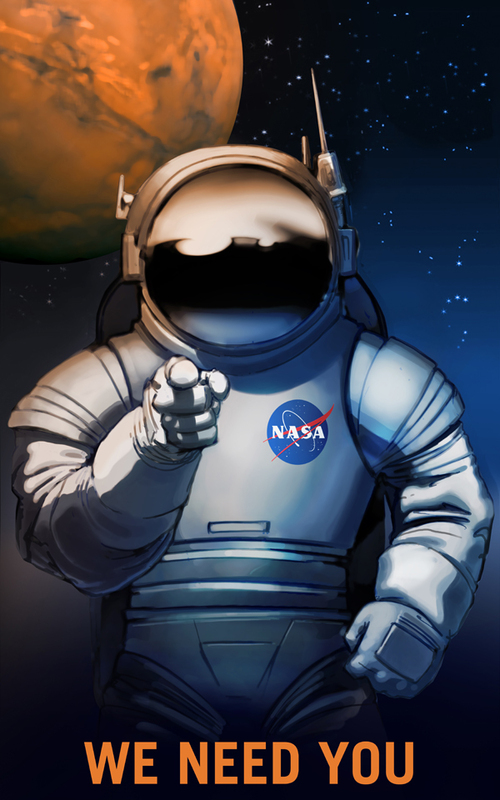 Doesn't this fabulous artwork remind you of the 1950-60's era and the intense interest we all had in space and spacemen? I recall there was so much inspiring artwork showing men in spacesuits, even though at the time it was before we had put men in obit around the earth never mind set foot on our moon. Packets of breakfast cereal came with plastic model spacemen and rockets. 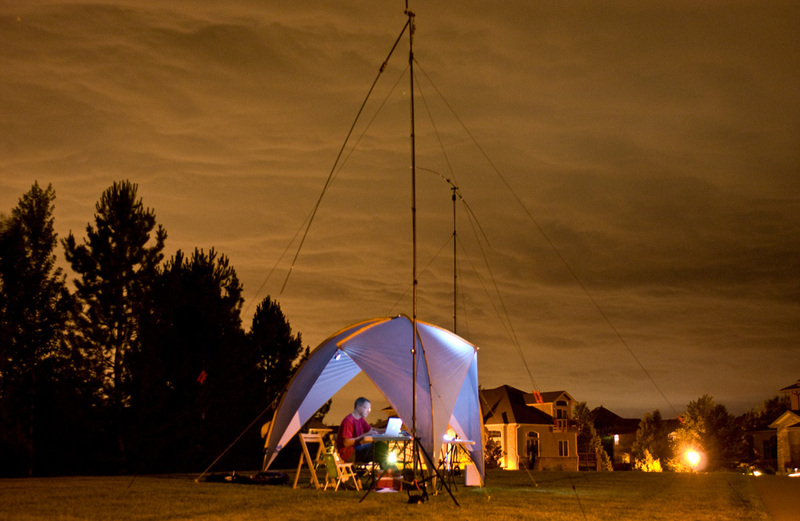 It struck me that amateur radio will play a huge part for those who venture to Mars and Phobos, as they will need the type of people who have the practical abilities to improvise and repair equipment while severely restricted in the availability of spare parts. NASA should do a poster showing an intrepid Mars Soldersmoker with his workbench with some piece of electronic equipment in pieces. Pete "The Crossword Guy" K4PHS here again. And, of course, the answer is KNACK! "Keep Calm and Melt Solder"
I was quite pleased with the valuable items obtained at the Manassas Virginia Hamfest this morning. Armand WA1UQO and I once again combined forces, offering each other advice and counsel (NO! Forget it!) as we went through the flea market. TOP ROW: 1) A bunch of boxes. Nice aluminum boxes and two really good chassis. I may now have to build something with thermatrons. Armand gave me a really nice Ten-Tec box. Thanks Armand! MIDDLE ROW 2) Ten much needed coax patch cords. I promise to check the connections before using them. Really. I mean it this time. 3) A nice circular coax switch. 4) Two large hemostats. I told the woman I needed them for some surgery that I'd be performing later in the day. She was not amused. 5) A homebrew SWR Monimatch box. Amazing. Dennis Klipa and I have been talking about these, so I bought this homebrew version. 6) Nice Jackson Brothers reduction drive with tuning indicator. 7) Really nice variable cap. 8) Three crystals: two for 3.579 MHz CBLA work, the other for 40 meter phone. As we were making the rounds we ran into Charles AI4OT. On the tailgate of his truck Charles had a BITX20 in operation! You can see it in the picture. Great to see you Charles and FB on the BITX. 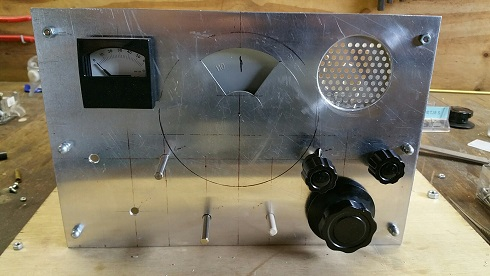 Jan is at it again, this time building a Dutch version of Lew McCoy's Mate for the Mighty Midget. Look at front panel! But wait, there is more! 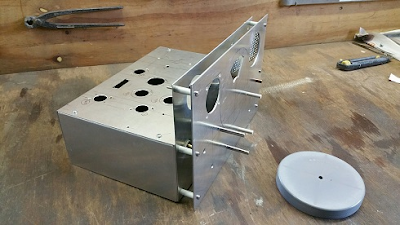 Here is a side view of the chassis. Wow. What, you may ask, is that round thing? Holy cow! Homebrew Vernier reduction drive made from the cap of a sewer pipe. And a homebrew dial cord arrangement. 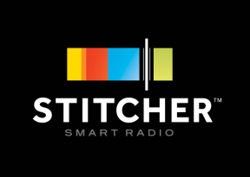 Jan is clearly breaking new ground in ham radio homebrew re-purposing. Here a little update on the MMrx. Got almost all the parts, except for the Miller 4411 300 uH coils, for which I am attempting to make my own. There is no mention of the MMrx, but the text is very in line with the latter. Nice read. Also while looking for parts, I saw this supplier of FT-241 xtals who sell for reasonable prices ($10) . The drum is made from a sewerage end cap got from the hardware store. Added a front control to switch the BFO on/off, together with another crystal or some arrangement to make AM (broadcast) reception possible. 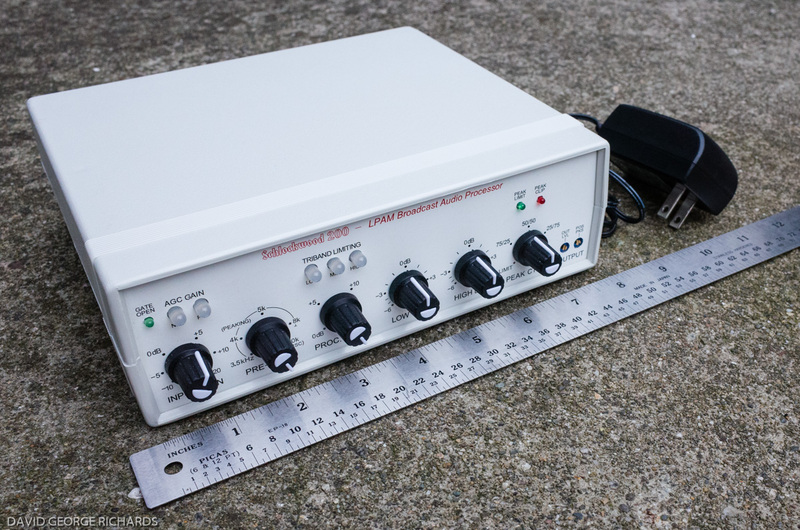 I want to try a regen detector instead of the 2 germanium diodes, followed by a pentode for some more audio output. Regen and AF gain control are also at the front. 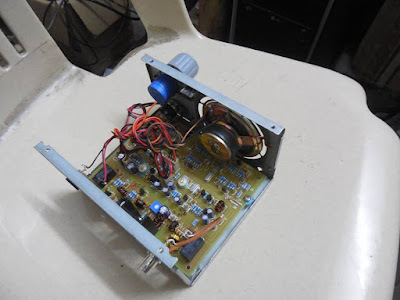 As there is no AGC, the (S) meter will measure the plate current of the RF amplifier tube. So, a lot of experimenting to do, and still busy with some of the mechanics. I found this in my junk box. I've put it in my old Mate for the Mighty Midget receiver, in the place of the Toyo CM455 crystal-mechanical filter (which I found to have excessive insertion loss). I think its very cool how they squeezed two variable caps into that little can. Designed in 1956. Works great. Note the promised passband: 4.7 kc at 6 db down. Not bad for an LC device. Three cheers for Elecraft! Three cheers for Bob Crane! Steve Silverman sent me this link. This web site has been getting a lot of attention from the solder melting community. And justifiably so. 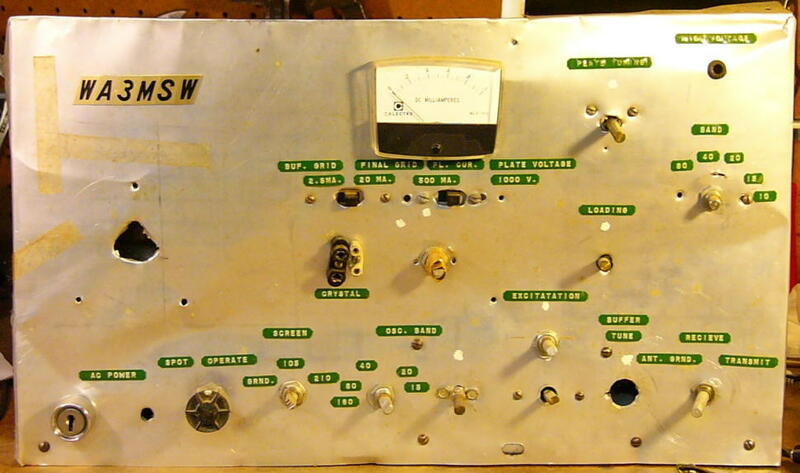 Behold (above) the first transmitter built by Robert Glaser, now N3IC, circa May 1969. The chassis and front panel were made from flimsy printing press sheet metal. Note the key (as in lock and key) switch that the OM put on the front panel -- he took his responsibilities under FCC regs quite seriously. My favorite part of this rig's story is that when he got it done, he didn't have the two 6146s for the final. 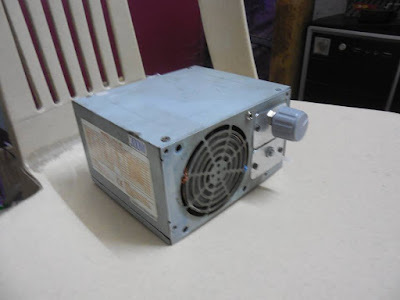 So he just took a capacitor and used it to connect the driver tube to the output network. Brilliant! With that arrangement he made his first contact. No wonder he labeled it "Excitatation!" It was clearly more exciting than your standard excitation. Those TV power transformers look very familiar. 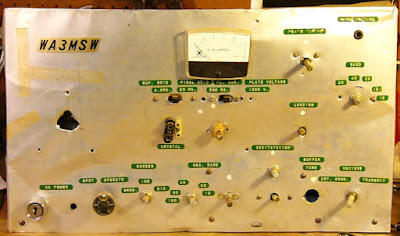 I was using similar devices to build a power supply for an HW-32A a few years after Dr. Glaser built this rig. It's a wonder we survived. 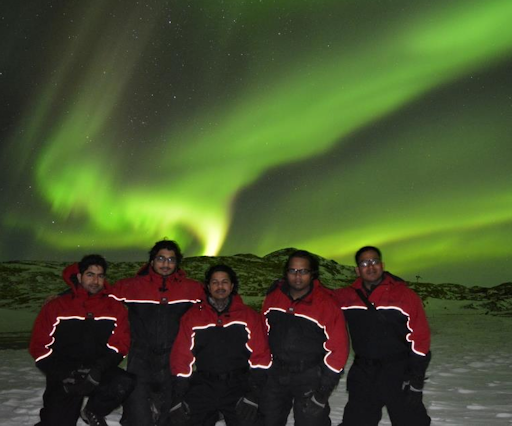 This amazing picture was taken last night at the Bharati Indian Base Station in the Larsemann Hills of Antarctica. The researchers there report that the aurora was so bright that it cast shadows. Yesterday I was having a nice 40 meter SSB contact with N3TDE. Rich is 179 miles away, in Pennsylvania. 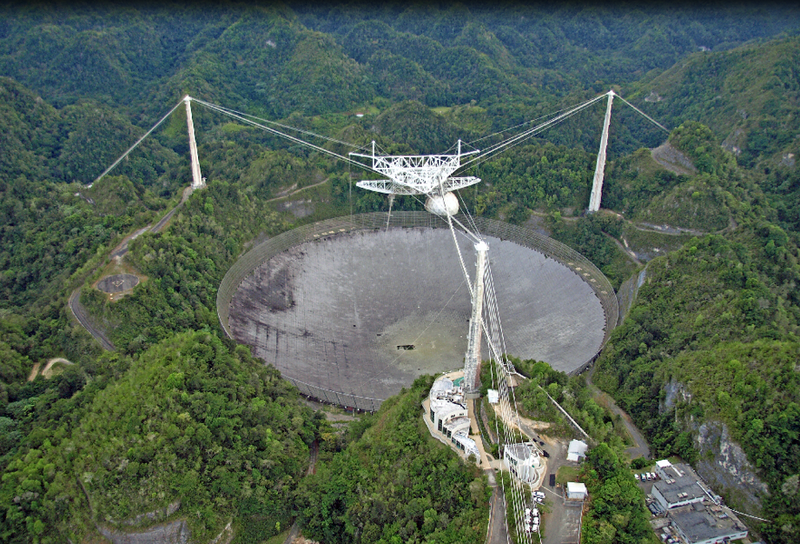 At 1650 UTC, his signal very suddenly dropped into the noise. The purple lines along the bottom of the chart below probably explains both the aurora and the abrupt end of my 40 meter contact. Jaydip VU3JOJ came up with a really inventive way to box up his new BITX transceiver. Nicely done. I especially like the way he put the speaker in the space intended for the fan. Very nice. 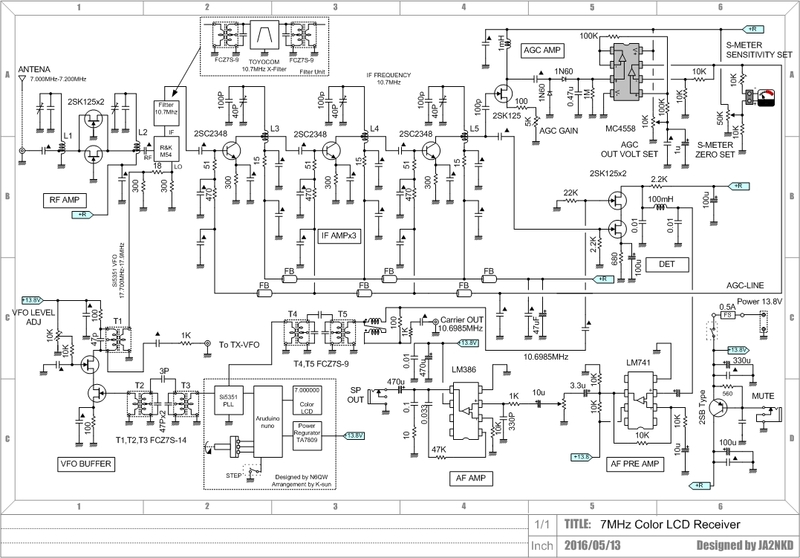 This appears to be one of the new BITX 40 meter "modules" described in yesterday's blog post. FB! How fortunate the new board fits in the power supply boxes. That's very lucky. You know, I had an old computer power supply in my hand just yesterday. I almost threw it out. Obviously that would have been a mistake. Today was a BITX day. Using my BITX DIGI-TIA on 40 I had a long QSO with Rich N3TDE. Rich has a BIT20 built from a Hendricks kit acquired at Dayton. He takes it with him on the Appalachian Trail. Wow, that board is a thing of beauty. And the story behind it is even more beautiful. Our friend Farhan took his famous BITX circuit, shifted it to 40 meters, and put the whole thing on one small board. It is now a module, but a module that makes up an entire SSB transceiver. The idea is that this module can provide a base for expansion and experimentation. You can add a digital display. Or a (gasp!) digital VFO. Or an RF amplifier. Or more bands. Or all of the above. It is a very cool idea. Here is the most beautiful part: In an effort to help people who need help, Farhan has arranged for a collective of women to assemble the boards in their homes. They needed work, and Farhan gave it to them on good terms. Bravo Farhan! 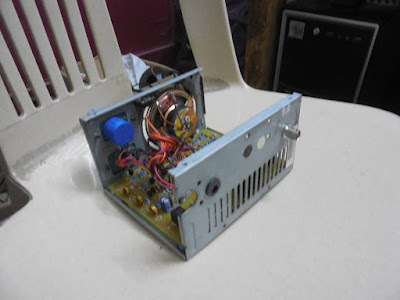 In keeping with the earliest purpose of the BITX rigs (simple transceiver for Indian radio amateurs) this board is currently only available in India. They are in Japanese. Google Chrome does a poor job at translating them, but you can get the gist. In any case the pictures are great and the schematics are understandable by all of us. Thanks Ryuu! Grayson Evans was at Dayton. Scheduling problems prevented him from being interviewed by ace correspondent Bob Crane, but Grayson was kind enough to e-mail us the essence of his presentation. And it is really wonderful. He brings the advantages of the Manhattan construction technique (fast prototyping, all components on the same side of the board, easy modification) to the world of tubes (aka valves or, as Grayson prefers, thermatrons). We also see in Grayson's work an admirable willingness to bridge the digital-analog design, to bring into his rigs the best of the old and the new. Thanks Grayson! For a long time I have been trying to develop some techniques to prototype Thermatron projects as easily as the typical “Manhattan style” solid-state construction. Thermatron projects you see now-a-days still use the traditional technique of mangling aluminum-drilling and mounting everything to a “bud” style chassis. This just takes too much time and my projects always look disappointing. 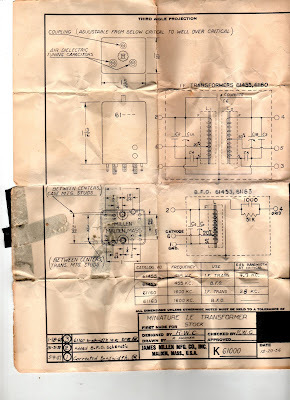 Fortunately, around two years ago, Rex Harper, W1REX, came to the rescue after hearing an earlier talk of mine and developed a set of thermatron socket pads. The MeTubes panel from QRPme consists of 10 prototype pads for thermatron sockets. The panel has v-scores for breaking the panel into single tube pads. The panel has pads for mini 7 & 9s, octal, compactrons and acorns. Awesome. The best sockets to use with the pads are PCB style. These provide a large pin area to bend out and solder to the pad (see photos). I pre-mount a dozen or so of the 7-pin and 9-pin sockets on MeTube pads so I have them ready to go when prototyping. The “crude” example below shows and 7 and 9-pin socket on one of my prototypes. I think this was a microphone amp for my AM transmitter. Pardon the mess. The nice thing about the pads is that they provide plenty of room to tac solder lots of parts to a single pin–easy to add or remove parts. This is a lot easier than using the traditional tube socket pin. Prototyping thermatrons in this way is FAST. No more punching out holes to hold thermatron sockets in aluminum chassis! But it is still nice to be able to have the thermatron on the “top” of the board and the components on the “bottom” of the board. To do this and still use the MeTube pads, the thermatron has to be mounted on the other side. I did this by mounting the socket through the MeTube pad. This requires making a hole in the center of the pad to pass the socket through and then soldering the pins in the usual way. This is way easier with PC mount thermatron sockets and make a very nice installation. This technique has some great advantages over using the traditional socket with pins. The pad has a lot more room to mount components to each pin. Normal thermatron socket pins are difficult to attach more than two wires and it’s a bit more difficult to get a good solder connection. The pads are easy to solder to and allow components to be easily attached in any direction since the “socket” is now flat. It is also easy to attach the socket/pad to a copper clad board. The same hole must be made in the copper clad board to pass the top of the socket through, then the pad is superglued to the board in the regular way. 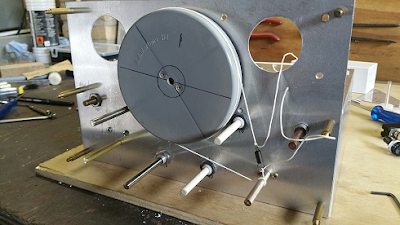 This is another example of “right side up” thermatron mounting on a prototype test board for crystal filters. I mounted a small “plug board” (not sure what you call these things) in the center to allow me to easily swap filter components. Notice the acorn thermatron soldered direct to the pad. The board works great, the filter design sucked. I gave up. Maybe too much distributed C.
I used this technique, combined with Roger Fell’s idea of using inverted aluminum chassis, to build my latest project, a QRP AM/CW transmitter. I’ve been wanting to try out a few new ideas and this seemed like a good project to try them on. I also wanted to build the transmitter in modular “blocks”, interconnected in a similar way to Rogers. It worked pretty good although I am still trying to get the thing to work right. Even new construction techniques can’t cure my screwups. BTW, the ANALOG VFO is ROCK SOLID. +/- 10 Hz over 30 min. Even I was impressed. The Hartley oscillator is the best circuit for thermatron circuits by far. I’ll send an update when I get it fully working on AM and CW. Jun JH8SST made this nice video about his version of Pete Juliano's Simpleceiver. I like the approach of putting the stages on separate boards, but perhaps Jun could have made things easier by using Manhattan-style construction on those boards. And of course I like the breadboard-style aluminum sheet. FB Jun. I've built a simpleceiver, which is a modified version. My first main board didn't work because of several problems, and that's why I decided to divide the board into several separated PCB's with some circuit modifications. RF and Mixer stages are original, but I employed an 8pole 9MHz ladder Xtal filter. The J310 X 2 is used in IF amplifiers, but load resonant circuit is modified to use a type 10K coil form and a ceramic capacitor. J310 product detector is original and built on a tiny PCB, as shown in attached photo and YouTube Video. This modified Simpleceiver has high sensitivity and more than enough gain. I needed to reduce RF/IF gain to eliminate product detector distortion caused by stronger signals. This simpleceiver works really nicely. I'm going to re-modify it to make it as original as possible. 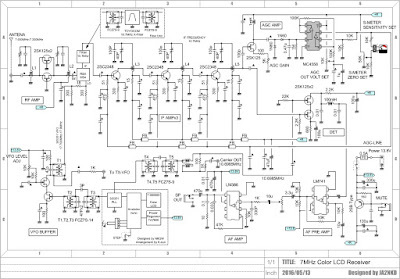 The block diagram is: J310X2 RF－DBM－9MHz 8 pole X'tal Filter－J310X2 IF－J310X2 IF－J310 product detector－AF　μA741－AF LM380 with NFB. I'm going to re-modify it as: J310X2 RF－DBM－J310X2 IF－12MHz 4 pole X'tal Filter－J310X2 IF－J310 product detector－AF　μA741－AF LM380 with NFB. I'm also going to add an AGC system using a modified W1FB AGC circuit.